June 1919, Lodi, California, Roy Allen sells his first root beer for a nickel. Allen eventually took on a partner in 1922, Frank Wright, and together they formed A&W Root Beer, the name originating from the first letter of each of their last names. 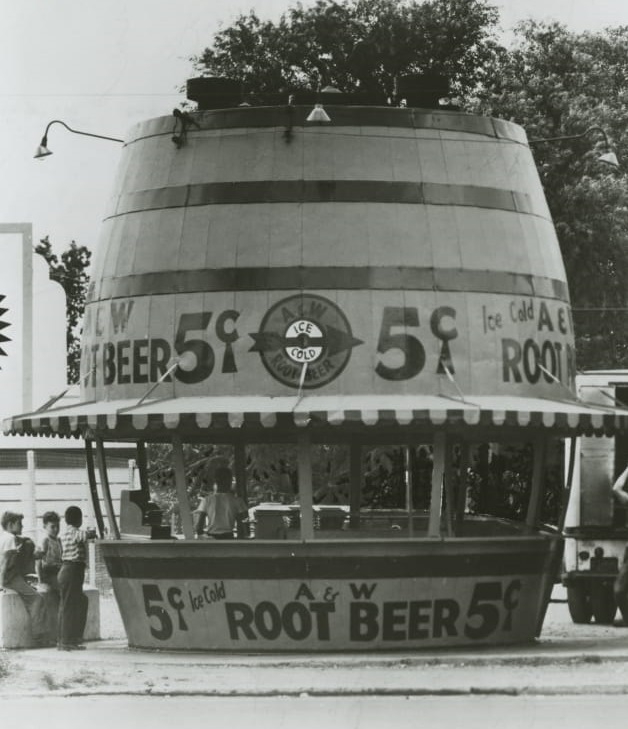 Although several different types of stands and restaurants were created to serve up their delicious, frothy, A&W Root Beer, one of the more intereting ones was the barrel stand. Literally, a giant barrel with walk up windows, several of these were made and distributed all around California and the west. 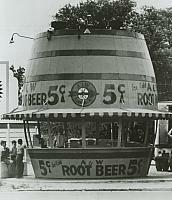 Although the barrel A&W Root Beer stands are for the most part long gone, a few still reside in California, just no longer as root beer stands. For years an orange with black stripes giant barrel has been in Boron serving up food and is one of these former A&W stands. It's basically a food stand with a small outdoor eating area consisting of a few tables and some picnic benches. The giant barrel has a walk-up window, and the place serves all sorts of the usual fast food such as hamburgers, hot dogs, french fries, tacos, etc. At one point it was painted white and called Dinky's. Now, it is just called simply "Barrel" which seems much more fitting. Across the street are three giant stone turtles, for no apparent reason. They are surrounded by a low wooden fence and are located in a dirt parking lot. There's basically a small, medium, and large turtle and they have painted circles on their shells. Looks like they have square wooden eyes. There's also a small donkey and a large strange rock shaped thing on the other side of the parking lot. Boron, California is also home to the largest open-pit mine in California and the largest borax mine in the world. In addition to the barrel food stand and the giant stone turtles, there is also a rather large tire (just to the right of the turtles) and a very large dump truck on display. Four additional former A&W Root Beer stands still exist in California. All four of them are in San Diego county in El Cajon, San Diego, National City, and Escondido. There is also a former stand in Mesa, Arizona and Amarillo, Texas. Rosendo's Taco Shop: 1408 East Main Street, El Cajon, California 92021 - formerly Variety Barrel and then El Barrilito. El Indio De Tijuana Taco Shop: 810 North Broadway, Escondido, California 92025 - formerly Michael's Drive In. 1550 Palm Avenue, San Diego, California 92154 - formerly Barrel of Flowers and then I.B. Printing.